Happy Wednesday everyone! 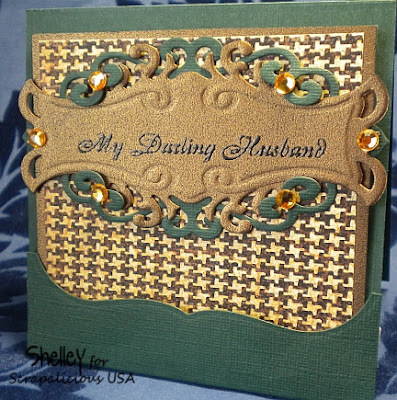 Our challenge this week at the Scrapalicious USA Blog was to create a card for a man. I decided to tackle the very difficult task by making a Father's Day card for my husband. But, I do believe this card could also be an any occasion card. Really the only difference would be what the sentiment said. I wanted it to be somewhat classy and elegant, but not too ornate or frilly because my man is NOT a frilly kind of guy. In fact, this would be borderline even for him. In order to create the embossed sentiment since I didn't have the correct stamp I wanted to use, I measured the inside portion of the tag I wanted to use and created the verse in Word on my printer using text box and creating the exact dimensions. As soon as it printed I immediately poured embossing powder over the image while the printer ink was still warm. It adhered perfectly! Then I heat embossed it and cut it out with my spellbinders Fancy Tags Two. So easy! Then I layered my sentiment on another tag from the same set and added a little bit of bling...simply because I couldn't resist. This is a pocket card. It's really simple to do and if you are curious how it's built, you can watch this video for more specifics. In the video the card will measure 6" square. I didn't have a spellbinders die that was that wide, so I altered mine to a 4" square card instead so it can make the ornate edge of the pocket. I used the spellbinders set Labels One. On the back of the pull-out card I also included a little poem, but you could add any verse or sentiment. The pocket part of the card also opens up so you can write a personal verse. Love this card, and I hope you do too! 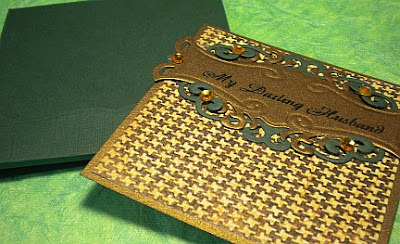 Here are the links to the spellbinders dies that I used for this card now available at Scrapalicious! Very elegant! And love the green & gold colors together. Will definitely need to check out that tutorial on how to make this type of card. Thank you for joining us at Crafting for all Seasons. Very elegant card! Thank you for joining us at CFAS! This is wonderful! Your husband is going to love it. Haven't tried a pocket card in a long time, this makes me want to try again. Such an elegant man card. I love it. 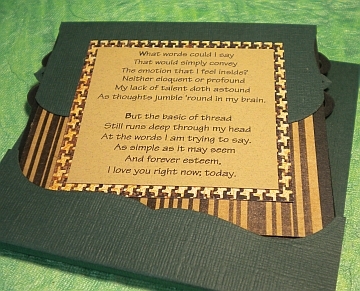 This is a fantastic card and verse - I'm sure your husband will love it. What a fabulously masculine card!! Thanks for the link to the video too, this is a stunning pocket card! Thanks for joining us at Freshly Brewed Challenges. This is amazing!!! WOW!! !I love the colors and this design! What a lovely male card! Love the design!